Since the evidence of genuine salvation is the presence of the Holy Spirit within the individual, how can this be verified? How can we be reasonably certain about ourselves, as well as others, without being guilty of judging? To answer this, let's take our own case first-there are several "tests" that we can take to determine His presence within us: (all Scripture quotes from Parallel Bible, KJV/Amplified Bible Commentary). 1. Romans 8:16 tells us: "The Spirit Himself [thus] testifies together with our own spirit, [assuring us] that we are children of God." First and foremost, we have the unshakable testimony from within us! The indwelling Holy Spirit of God constantly reassures us that we belong to Jesus Christ. We intuitively "know" this to be a fact. 2. The entire book of First John was written as a "test" for determining the reality of salvation. Verse three of Chapter one tells us: "What we have seen and [ourselves] heard we are also telling you, so that you too may realize and enjoy fellowship as partners and partakers with us. And [this] fellowship that we have (which is a distinguishing mark of Christians) is with the Father and with His Son Jesus Christ, the Messiah." The fellowship enjoyed by genuine Christians is proof positive of salvation. Those who claim Christ, but yet rarely attend church to worship God and associate with other believers, are possibly fooling themselves! A backslidden Christian can stay out of church and away from other believers, but I can guarantee you from first-hand experience that there will never be a time when you will be comfortable with it! On the other side of the coin, verse 8 teaches us that if we deny the existence of sin within us, the Truth is not in us. Verse 3 of Chapter two teaches us that we are genuine and "growing in grace and knowledge of Christ", if we keep His commandments. Verse 10 teaches us that we are of Christ if we love the brethren. Again, those who habitually absent themselves from God's house and do not make it clear that they love being around God's children, are very likely to be tares and not wheat. Verse 15 teaches us that if anyone loves the world, the love of the Father is not in him. "Worldly Christians" is almost a contradiction in terms and those who claim Christ, but yet cling to the value system of this world-are suspect. 3. 1 John 5:13 informs us that the entire Book of 1 John was written so that we can know that we possess eternal life in Christ. 4. 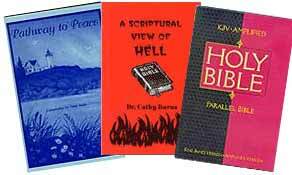 The Word of God teaches that the Bible is incomprehensible to the "natural man"-the unsaved individual. It is a spiritual book and the unsaved person is not only spiritually blind, but 1 Corinthians 2:14 tells us that he "is incapable" of knowing that which is spiritually discerned. Do you understand the Bible? Does it make sense to you and speak to your heart? Does it convict you of your sin and teach you the right way? Now, allow me to pray. "Father, you have heard the prayer which has been prayed. I ask that in this quiet moment, Thy Holy Spirit will grant unto him Your absolute assurance of life eternal; grant unto him the certainty that his sins are forgiven. Grant that he may hear, in the depths of his soul, Thy voice saying, 'Thy sins be forgiven thee. Go in peace'. Grant, O Jesus, that he may hear Thy voice saying, 'As far as the east is from the west, so far have I put thy sins from thee, never to remember them against thee anymore. [The person] that believeth on Me shall not come into condemnation . He that trusts in Me is passed from death unto life. He that believeth on Me shall not perish but has everlasting life [paraphrased from Psalm 103:12; John 3:1 8; 5:24; 3:16]. In Jesus' Name, I pray. Amen." Please write back to tell us if you have decided to become Born Again. We need to give you some practical advice on how to ensure your continued maturity and productivity in the Lord. When you e-mail us, please put "Born Again" in the subject field.